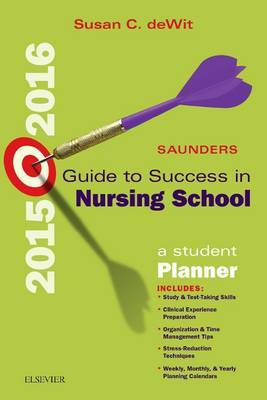 Saunders Guide to Success in Nursing School 2015-2016 contains loads of organizational tools, clinical information, and helpful nursing school guidance all within one compact resource. The new edition also features the latest information on electronic documentation, computer-based testing, the flipped classroom, and Post-Traumatic Stress Disorder, along with prefilled weekly, monthly, and yearly calendars to help you plan for the 2015-2016 school year. In all, this guide's clinical tools and strategies for time management, studying, testing, and stress-reduction will significantly relieve the common aches and pains of nursing school and help you perform to your fullest potential both inside the classroom and throughout clinical practice. Important clinical references and assessment scales are highlighted to give you easy access to normal vital signs, lab values, abbreviations, measurements and conversions during clinicals. Common medication and IV therapy administration guidelines, TJC Do Not Use lists, and high alert medications emphasize medication safety from the beginning of nursing school. NCLEX Exam strategies prepare you for the alternate-format question types found on the current licensure exam. Advice on study skills, time management, and stress reduction techniques improve your focus and increase efficiency. Space-saving, compact design provides a clean and efficient layout that is easy to bring along to class and clinical rotations. NEW! Updated orientation section includes the newest developments in computer-based testing and flipped classroom settings. NEW! Thoroughly revised Clinical Reference section features updated information on electronic documentation and new content on Post-Traumatic Stress Disorder. NEW! Updated weekly, monthly, and yearly calendars for the 2015-2016 year help you keep an organized schedule.